In honor of National Robotics Week, we spend the majority of this post diving into the benefits of joining a robotics team or club! But first, here’s a brief overview of what these competitions and teams are all about. A robotics club is a gathering of students who are interested in learning about and working with robots. 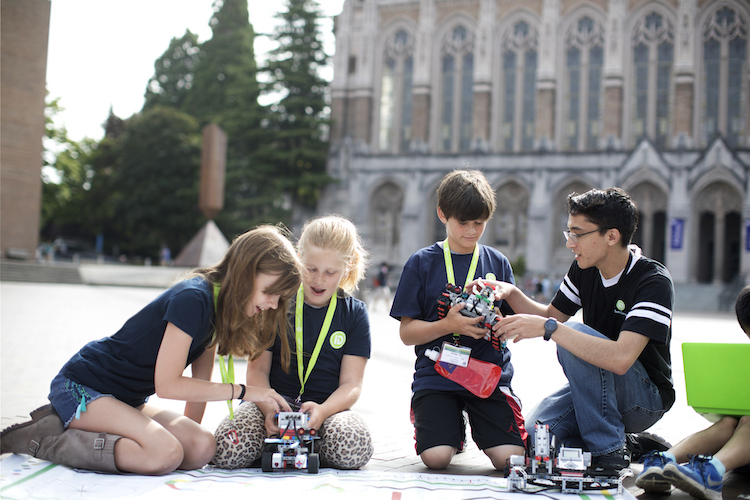 At school, robotics clubs typically take place after school, in a classroom, and moderated by a member of the teaching staff or school administration. At robotics competitions, teams of students must design and build a robot that can compete against opponents in a series of specific challenges. Students develop and program their robot in the weeks before the event, adhering to list of preset rules and regulations. Much like traditional sporting events, these robotics competitions draw large crowds who gather to see which robot will best perform the task it has set out to complete. Local competitions might attract a few teams, whereas international competitions draw thousands of students from all over the world. Who can join a robotics club or team? Robotics teams target students at almost every age group, starting with kindergarten and going all the way to college and post-grad programs. Of course, the structure and objectives of these competitions vary greatly depending on the age of the student. For instance, early education programs introduce kids to robotics and programming concepts, challenging them to start thinking like a robotics engineer by encouraging them to create solutions to fun, kid-friendly problems. On the other end of the spectrum are highly competitive teen and college-age programs, where students train year-round to prepare for tournaments. Download our 2019 brochure to learn more about getting your child started with robotics. What do you do in robotics club? When and where are meetings and events held? Your student can participate in local, regional, national, and even international robotics competitions. Programs are held year-round, though there are competition “seasons” for some organizations. While many events are in-person, there are some online challenges available. Talk to any robotics team member (or their parents!) and you’ll hear tons of reasons for joining a team: from fueling students’ passions and learning professionalism to participating in a sport where everyone can turn pro, and more. Here are some of the top benefits your child could gain from joining a robotics competition team. To create a competition-ready robot, students use a number of soft and hard STEM skills. Creativity and problem-solving are essential in building a ‘bot that can complete obstacles. Your child will have to think outside the box and come up with creative solutions when the robot doesn’t perform as expected. In addition, robotics competitions require a solid understanding of math, coding, and engineering. Is your student a beginner? No worries, you don’t have to be a pro to join a robotics club. Hanging out with like-minded peers is always a great way to make friends and build camaraderie. Yet many students struggle to build strong friendships during their transitional middle school and high school years. If your student is passionate about tech or robotics, joining a club can be an excellent choice socially. Many students say this is their favorite part of joining a robotics club. Kids and teens gain many social and psychological benefits from engaging in team sports. Yet traditional sports aren’t every child’s cup of tea, right? Robotics teams provide the same opportunity for students to strengthen leadership skills, learn to cooperate with others, improve social interaction skills, better regulate emotions, and learn the highs and lows of competing. This benefit is for both your child and your bank account. Joining a robotics club can open the door to many scholarship opportunities for your child. Many of the robotics competition organizations offer their own scholarships, and in addition, the skills your student learns will make him or her more likely to qualify for other robotics-related scholarships offered by colleges or private companies. FIRST Robotics alone boasts $30 million in scholarships available to their participants. While robotics clubs have numerous benefits (much more than we’ve even outlined above), there are a few considerations you should make before jumping into a competition. Our kids’ schedules are already jam-packed with school, extracurriculars, sleepovers, and other occasions that require you to shuttle them around. If your student is already committed to a lot of after-school activities, you might want to nurture your child’s passion for robotics with short-term commitments, like our robotics summer camps. Some kids love the thrill of waiting to see how their robot will perform at the competition. For others students, these moments can bring about unwanted stress and might ultimately strip the fun and excitement out of building robots. You know your child best, so think about how they respond to judging and competition. Just remember: some discomfort helps us all grow, so don’t be afraid of a little disappointment or adversity. Those moments could ultimately motivate your student to dream up the next world-changing robot. Ready for your child to reap the benefits of joining a robotics team? Check out these helpful websites to find a robotics club near you. VEX Robotics Competitions: We use VEX robotics kits at camp!